THOSE who are not too familiar with cooking complicated dishes can try Hilton Petaling Jaya executive chef Ridzuan Malek’s easy to prepare 15-minute dish. He advised those keen to try the dish to prepare the prune sambal and percik sauce ahead of time and store them in the fridge. “You can save time if the sauce is made in advance. However, even the sauces are easy to prepare. “You can even prepare the sauces while making the roulade chicken,” he said. He said the dish was suitable for breaking of fast and can be served to guests during the Hari Raya celebrations. “The ingredients are healthy and the dish looks colourful,” he said. First prepare the percik sauce and prune sambal, separately. Percik Sauce: To make the percik sauce, saute items labelled ‘to blend’ until it turns golden in colour and releases an aromatic fragrance. Add the four spices as well as coconut milk and mashed peanuts. Season to taste. Prune Sambal: Saute onions, prunes, garlic, cloves, cardamom, pandan leaf, lemongrass, star anise and blended dried chillies. Season with brown sugar, salt and pepper to taste. Flatten the chicken and roll with the vegetables labelled as “Ingredient A” to make a roulade. Wrap the roulade with a clear plastic food wrap. Next wrap it with an aluminium foil. Poach the roulade for 12 minutes. Remove it from the boiling water. Slice the roulade into pieces. Sear the roulade in a pan until it turns light brown. Presentation: Lay the prune sambal between the Japanese cucumber sticks. 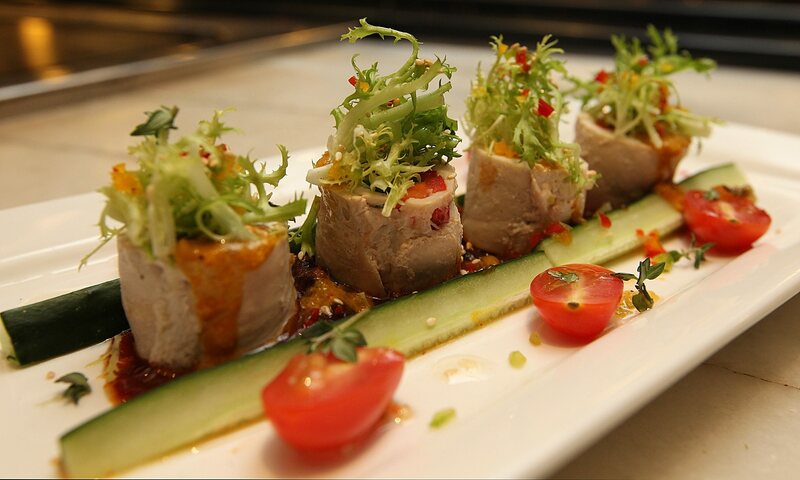 Place the sliced roulade on the prune sambal sauce. Decorate the dish with chopped bell peppers, frise vegetable and baby tomatoes tossed with vinaigrette. Drizzle with olive oil and percik sauce. Garnish it with toasted sesame and fresh thyme to finish.